JKBOSE announces new dates for postponed exams for class 12 Jammu region, summer zone exams. The class 12 exams were earlier to be concluded by March 18 but now have been extended till March 22, 2019. JKBOSE class 12 exam dates: The Jammu and Kashmir Board of Secondary Education (JKBOSE) has announced the new dates to conduct the exams which were postponed due to curfew in the region. General English paper will be conducted on February 26 will now be conducted on March 3 and the Geography exam which was to be conducted on February 23 has now been scheduled to be held on March 22, 2019. 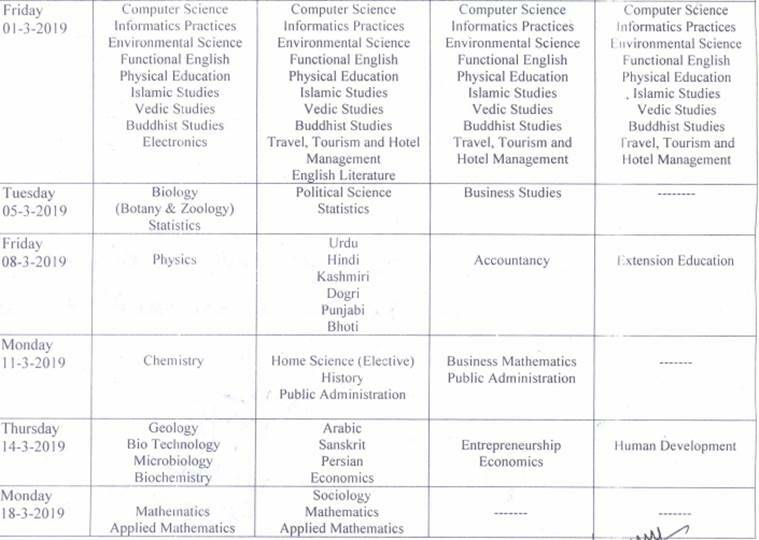 These exams are class 12 Jammu division, summer zone students. While rest of the exams have been going on smoothly, these exams which were also the first two exams for class 12 Jammu division, summer zone students were postponed after curfew was imposed to ensure security in valley post the Pulwama attack. As reported by The Indian Express earlier, curfew was clamped in the town following violence during Jammu bandh called by Jammu Chamber of Commerce and Industry to protest the killing of 40 CRPF personnel in a terror attack in Jammu and Kashmir’s Pulwama. Students can refer to the official website, jkbose.ac.in as well for future reference as no communication will be provided individually to candidates. The class 12 exams were earlier to be concluded by March 18 but now have been extended till March 22, 2019.